Every genealogist eventually finds themselves with more paper than they know what to do with. Records, photos, letters, and other ephemera inevitably begin to pile up in the pursuit of our ancestors. So how do you preserve it and protect it for future generations? One Genealogy Gems listener wrote in with the online tool that has her one step closer to living a paper-free life. 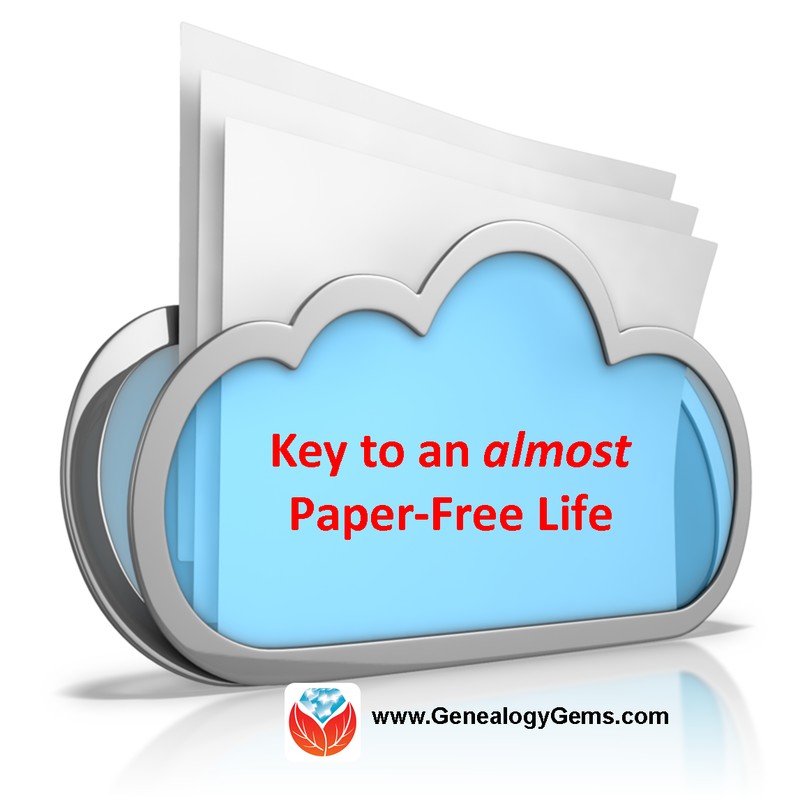 Have you dreamed of living a paper-free genealogy life? One where there are no sticky notes surrounding your computer screen and–not so much paper piling up on your desk that your actual remaining work surface is about the size of a sticky note? It happens to the best of us! And much of the reason is we haven’t felt confident about our ability to keep digitized versions of the paper truly safe. I wanted to let you know that I just purchased Backblaze to back up my files. I thought you might be interested in my story. I did my first genealogy project in high school in 1971 and got an A+ on it. I’ve attached the title page for you to enjoy. Well, that project ignited my lifelong passion for family history. During the past 44 years, I’ve amassed a LOT of documents, photos, and videos as you can imagine. I wanted them to be protected. I wanted everyone to be able to use them and benefit from my lifetime of research. I purchased a few external hard drives for storage but couldn’t bring myself to toss much of the physical items at all due to fear of the hard drives failing. I tried several cloud services but none of them fully met my needs. Then (on The Genealogy Gems Podcast) I heard your endorsement for Backblaze and tried it out. I knew immediately this was the service for me, especially because you vetted it out and I trust you completely. Now I can finally toss all that unnecessary paper and almost live a paper-free genealogy life! Thank you for all the wonderful things you do for the genealogy community. You are a hero in my eyes. Thank YOU Michelle for writing in, sharing your story about how you are using cloud backup as part of your paperless strategy, and your kind words. 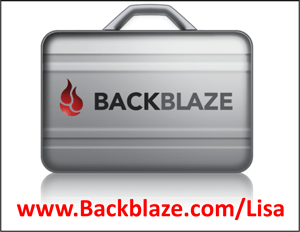 Backblaze is the official cloud backup of Genealogy Gems and we truly appreciate their sponsorship which helps keep The Genealogy Gems Podcast available for free to all genealogists. 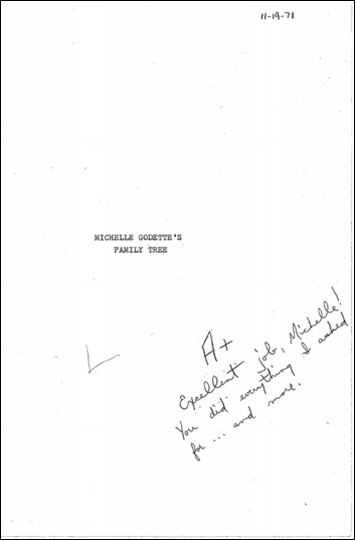 And Michelle is very lucky because she even has a record, in the handwriting of her youth, of when she first caught the genealogy bug. 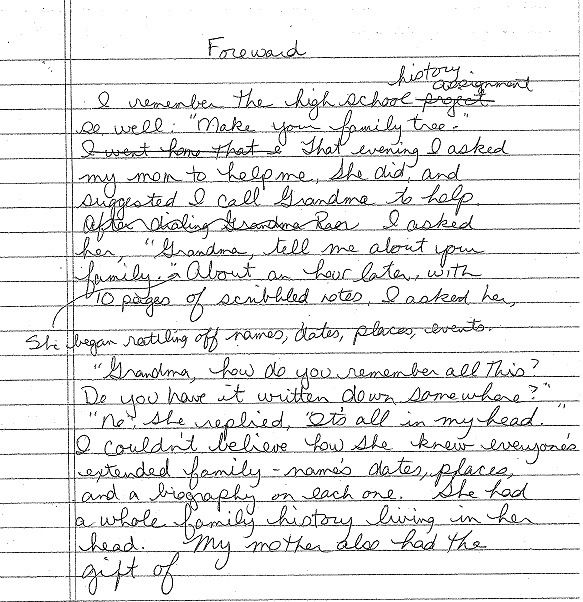 Below Michelle shares the rough draft of the foreword to her paper that describes her first encounter with her Grandma on the subject of family history. And now Michelle does too! Do you? Click below to watch my free video class that answers YOUR questions about cloud backup. You’ll learn all about what cloud backup is, how it works, what services are available, and most importantly, how it can save your previous files from being lost or destroyed. If you’re ready to protect your data, there’s no one I trust more than Backblaze. Get peace of mind knowing your files are backed up securely in the cloud. Backup your Mac or PC just $6/month – that’s about the cost of one latte! It’s incredibly easy to sign up, and you can even opt for a 15-day trial to make sure Backblaze is right for you. Click here to learn more and sign up now. This article was originally published on July 2, 2015 and updated on April 12, 2019.